探索赫爾辛基市中心以外的神秘世界 Venture outside Helsinki city center! I live in Vantaa. Sometimes I am quiet confused about how much should I pay if I am going across regions. It’s easy to travel all the way to Helsinki city center, however it is another story to travel to different places other than Helsinki city center. The train tickets have been more expensive in 2015, see here for the newest prices. The official public website instructed that “Journeys within one municipality in Helsinki, Vantaa or Kirkkonummi are one-zone journeys. 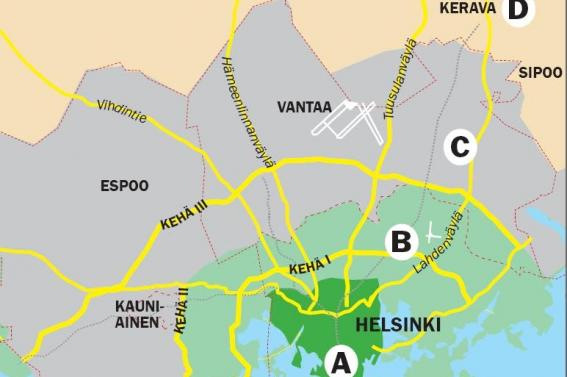 Espoo and Kauniainen as well as Kerava and Sipoo together form one zone.” So I guess that I don’t need to buy a cross region ticket if I am travelling from Vantaa to, for example, Kirkkonummi. But I am not sure. For venturing within the Helsinki area, you might want to check here for ticket prices and rules. Okey, the blue stops are ‘Helsinki’s inner transportation’, the green stops are ‘Espoo and Kauniainen’s inner transportation’, the red stops are ‘Vantaa’s inner trasnportation’, the purple stops are ‘Kerava and Kirkkonummi’s inner transportation’ and the black stops are ‘Finnish National Train’s zones’. If you have regional ticket (seudunlippu), you can travel within the solid line area (for example, within Korso and Mankki). If you live in Espoo and only have regional ticket, but today you want to go to Sipoo, you probably need to buy regional 2-zone ticket, which “entitles you to travel in Espoo, Kauniainen, Vantaa, Kerava, Sipoo and Kirkkonummi. The ticket is not valid in Helsinki and it does not allow travel via Helsinki.” However if you need to go to Helsinki or go via Helsinki, you need region 3-zone ticket.